Gravity is just another obstacle for rock climbers, who find plenty to do in Texas. Riddled with mountain ranges, the state is a hotbed for high-altitude climbers. But even low-altitude challenges nab attention; curious landforms tickle the minds of technical boulderers. 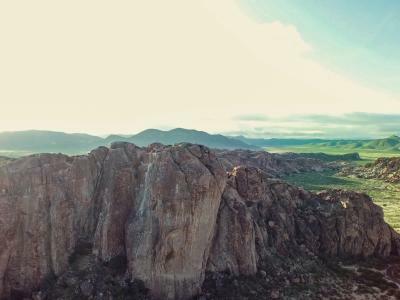 We ventured to Hueco Tanks to try the terrain. Exertion, calculation, achievement, courage, terror—rock climbing packs an exhilarating cocktail of mental and emotional states. 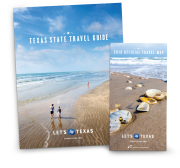 Texas, known for its diverse landscape, serves that cocktail like few other places. We ventured to a climbing mecca in West Texas for a chance at gravity-defying glory. 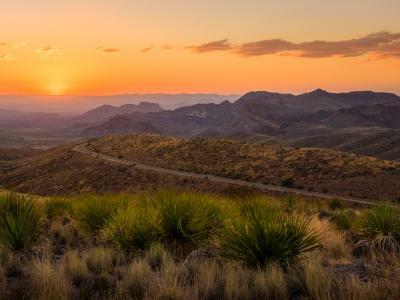 About 32 miles east of El Paso lies an invitation and a challenge: Hueco Tanks State Park & Historic Site, an 860-acre mass of rock and basins that dominates the desert skyline. Geology enthusiasts are fascinated by the area&apos;s syenite formations, shaped nearly 40 million years ago and then exposed by the erosion of surrounding rocks. Prehistory buffs come for the gorgeous pictographs. But the most ardent guests—those who travel from all over the globe—are the rock climbers. Bouldering, a style of low-altitude climbing that goes without ropes and harnesses, is wildly popular at Hueco Tanks. The park is considered one of the sport’s meccas, attracting hundreds during peak season, from October to March. Humbly, we threw in our lot. Our cadre included my leaden self, who naturally and correctly fears heights, and a rock-climber friend with the body and agility of Spider-Man. Going in, I knew our excursion would be a learning experience for me and a golden moment for him. I would be doing lots of looking up and encouraging. I would become a professional spotter. I would throw myself on crash pads to better break his fall, if it came to that. My expectations were borne out, except on that last point. But what I hadn’t anticipated was the place’s overwhelming beauty. The drive out to the park on rustic U.S. Highway 62 contrasted sharply with the pristine splendor of the site, with its impossible arches and mushroom-shaped rocks that seemingly bloomed from the earth. We’d called well ahead to book access. Hueco Tanks allows only 70 daily visitors to its North Mountain; the remaining areas are available exclusively via tour guide. Hoping to travel at our own pace, after the mandatory orientation video we embarked on a self-guided day on the North Mountain and its bouldering routes, or “classics,” as the regulars call them. And the regulars are thick. Hueco Tanks is downright seminal in the sport of bouldering; it’s where trailblazers codified many of the sport’s systems. John “Vermin” Sherman came up with his V Scale of grading at Hueco; the easiest non-beginner climbs are graded V0, while the most difficult to date are V16. The climbs we encountered on the North Mountain ranged from V0 to V6. We spent the day testing out classics on the easier end of the scale, beginning with an ascent of a route called the Melon Patch, graded a V0. It&apos;s a precipitous vertical climb up a flat rock face, with plenty of hand grips for a straightforward rise. Still, the feeling of achievement at the summit was gratifying, priming us for a day of conquest. My friend tackled tougher challenges with aplomb. He went through the Hershey&apos;s Symphony (V1), Nobody Here Gets Out Alive (V2), and the Sign of the Cross (V3) with the ease of a gecko, while the T-Bone Shuffle (V4) and Moonshine Roof (V4) slowed him but faced the same fate. The steep See Sharp (V6), with its nearly nonexistent dents and grips, confounded him on his first attempt, but he nailed it on the second try. I tried my hand at each, assuming I wouldn’t get far off the ground. Gradually, as the day wore on, I found myself improving, building muscle memory and internalizing tricks and tips. Bouldering is a surprisingly elegant mind/body game, requiring obvious strength and flexibility, strategy to calculate the next move, and control to prevent—and recover from—mistakes. With a deeper understanding, I revisited Nobody Gets Out Alive. I got out alive. Throughout the day, we met and chatted with enthusiasts, both tour guides and guests staying at Hueco Rock Ranch, a gorgeous house near Hueco that rents space to climbers. Owned by the American Alpine Club, the place holds bonfires and acts as a hub for the area bouldering scene. We learned that boulderers hold a huge competition called the Hueco Rock Rodeo in the spring. It attracts the biggest and brightest stars in the sport, while offering fun side events for newbies and pros alike. We also met several tour guides who can give tours of the park&apos;s South, North, and East Mountains. Our return visit is already well laid out. The toughest climb (or "problem" in bouldering parlance) at Hueco Tanks is Terremer, a V15 challenge on North Mountain. Discovered in 2006, it&apos;s been ascended only four times, most recently by Dan Beall in 2013.